O'Lampia Studio was founded in 1993 in New York City by Kwang Lee, a fine artist and lighting designer. Lee's vast collection of own original designs span from Gothic, Colonial, and Art Nouveau, all the way to modern, and have a contemporary interpretation which employs delicate proportions and detailed craftsmanship. 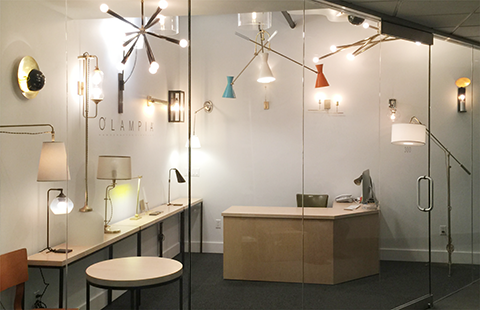 All of O'Lampia's lighting fixtures are handmade and crafted in-house in our NYC studio and factory. O'Lampia's designs have been featured in The New York Times, The Wall Street Journal, Architectural Digest, Elle Decor, and Interior Design, among many others. In O'Lampia Studio, everything is made to order. We take on orders of all sizes, including hotels, restaurants, and condominiums, as well as residential. All existing designs can be customized to fit the client's specifications for size and finish. We also do custom designs per client's blue prints. We have a wide range of subtle finishes that are available, but will also work with you to achieve custom finishes if desired. Please note that all orders require 4-6 weeks to complete. Olampia Downtown located at bowery and broome st.
Kwang Lee is a lighting designer and fine artist who received his MFA from Pratt Institute. He founded O'Lampia Studio in New York City in 1993. Lee's simplicity in form and understated design enlightens spaces across the globe. Marcus has been with O'Lampia since day one, and brings over 30 years of experience helping clients make the proper decision in choosing the best lighting solution. David manages all aspects of production, ensuring that every fixture lives up to O'Lampia's quality. Yul works with clients in our Uptown D&D showroom. Moon is a fine artist. He is taking care of our web site.